The calendar is the first thing any employee sees when they log into The Holiday Tracker. At a glance you can see any holiday requests that have been approved, any pending, and any other types of absence that’s been recorded. Below the calendar are the Holiday Entitlement and Sickness bars. As an employee begins to book holidays, the entitlement bar fills up and lets them know how much entitlement they have remaining. If any sickness is recorded for an employee, the sickness bar will also begin to move. If an employee has no manager set, then they can add their holidays to their own calendar. However, when an employee does have a manager, they must make a holiday request, which will then be approved or rejected by their manager. Making a request is as simple as three clicks. 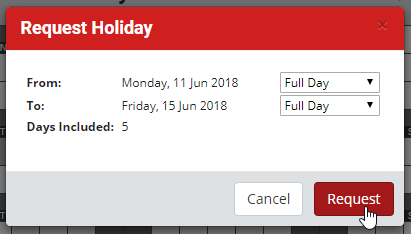 Click on the first day of the holiday, click on the last day of the holiday and then click to confirm. The request then goes into the calendar in orange and an email is sent to the employee’s manager. When the manager clicks the button in the email and logs in, they’ll be taken directly to the employee’s calendar where they can click on the request to approve or reject it. But they can also click View Team to view the request in the context of the rest of their team. The Team Calendar will be centred on the request and shows the manager who else in their team is off during that period, helping them make a decision on whether to approve or reject the request. Managers can also log other types of absence for their employees, such as sickness, unpaid leave or maternity. And of course, you can customise the types of absence that your organisation would like to record from the Company Settings page. Sickness absence can have a massive impact on small businesses. In fact, studies show that preventable sickness absence is costing the UK economy around £900 million a year. Like most things in The Holiday Tracker, adding a new employee is incredibly simple to do. From the Admin menu, click Add Employee. You’ll be taken to the Add New Employee page where you can fill in the basics such as name and email address. Enter a password of your choosing, or click Generate to generate a strong password for the account. 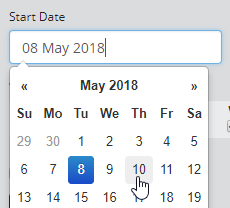 Set the employee’s start date by clicking in the box to access a mini-calendar. In the Full Time Holiday Entitlement box, enter the number of days’ holiday the employee is entitled to per year if they work full-time. 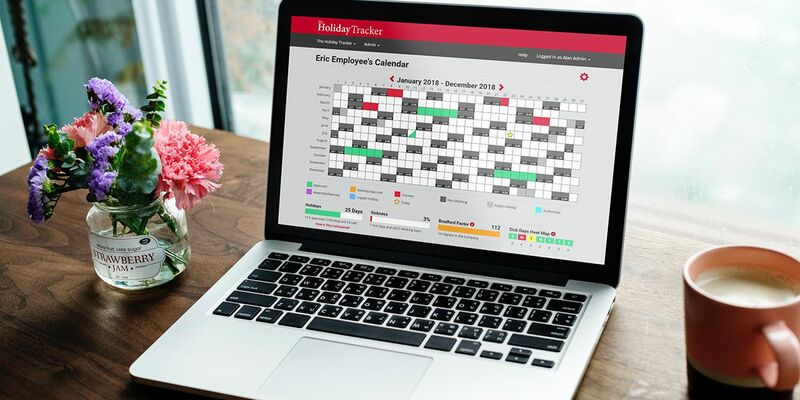 Even if they don’t work full-time, as The Holiday Tracker will do the calculations for you. You’ve already entered their start date, and you’re going to input their work patterns, so it has everything it needs to know to calculate their actual entitlement for you. Next specify whether you want to calculate their entitlement in Days or Hours. It’s best to leave this set to Days, unless the employee works different hours on different days, then setting it to Hours allows you to specify those hours as part of the work patterns, and The Holiday Tracker will calculate the entitlement figure in hours too. To add this employee to a team and specify who is responsible for approving their holiday requests, you need to set a manager. Start typing the name of the manager and then select them from the list. If you don’t specify a manager, then the employee will be able to add their own holidays without requiring approval. Finally, specify the employee’s work pattern by ticking the days they usually work, and if you’re calculating entitlement in hours, enter the hours they work too. Leaving this box ticked ensures that the employee will receive their login details by email within seconds of you clicking the Add Employee button. Once the employee has been added, you’ll be taken to their employee profile pages. From here you can record other useful information about the employee, such as driving license details and emergency contact details. Under the Employment History page you can change their work patterns, their full-time entitlement figure and make minor tweaks to their entitlement each year using entitlement adjustments. To return to the employee profiles pages at any point, click the cog symbol from the Employee List, or the top-right of an employee’s calendar page. If you want to import employees from an Excel document or CSV file, you’ll find an “Add Employees in Bulk” button at the top-right of the Add New Employee page. Follow the instructions on the subsequent page to upload your employee data.